“Trailblazing Women: Stories of Firsts, Risks, Self-Doubt, and Success,” hosted by the Carey Business School on March 7, brought together a panel of women of different backgrounds, levels of experience, and industries to share their unique stories of being first in their respective positions. Panelists included Alicia Wilson, senior vice president of Impact Investments and senior legal counsel, Sagamore Development; Donna Cichani, design strategy lead, KPMG, Experience Design and Engineering; Sharon Ritchey, head of change, T. Rowe Price; Sharonne Bonardi, deputy comptroller, State of Maryland; and Tracey Ford, president, Maryvale Prep. The event was moderated by Jill Green, associate dean for student development at the Carey Business School. Although their stories were distinct in both circumstances and opportunities, all panelists shared common hurdles to their advancement, including subtle (and not-so-subtle) biases, an entrenched culture, lack of innovative thinking, and an initial aversion of others to entertain new strategies and strategic approaches. Gradually, however, through hard work, superior achievements, inclusive networking, and confident determination, these women were able to change the cultural landscape, and their institutions’ fortunes, for the better. 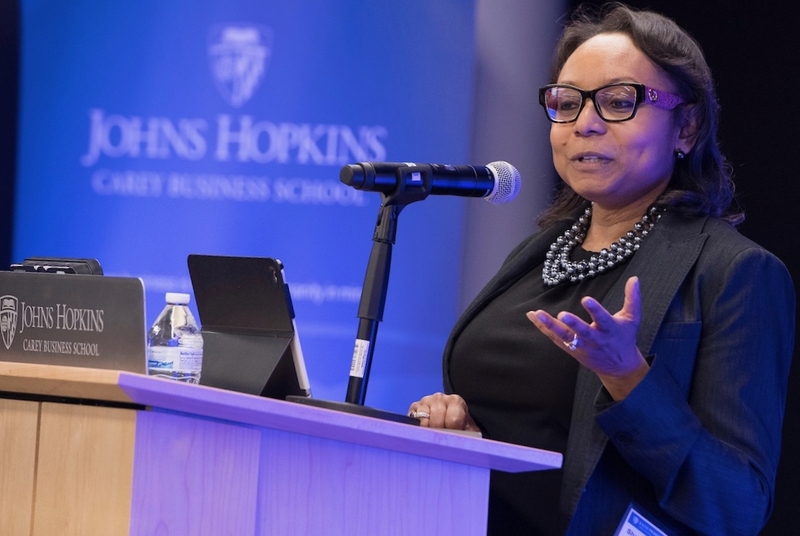 Wilson, who became the first African-American partner in the 60-year history of her firm, stressed the importance of developing connections throughout all levels of an institution to achieve professional advancement and career success. Trailblazing Women was part of a series of events at the Carey Business School dedicated to unlocking the leadership potential of women and to prepare them for leadership roles in the business world.